Here is an update on Paul the Pastor. We have a photo of him in hospital, and are tossed between posting it so you can see the surroundings of a District hospital in Kenya. However, his face is so swollen out of proportion and deformed that we decided not to show you. This cancer is a brutal beast!! He is diagnosed with Leukemia. At first they thought his kidneys and liver were also affected, but it turns out his kidneys are OK, and, although there is an infection in his liver that is being treated, it isn't cancer. He has been receiving chemotherapy and the doctor feels that it will be effective against the cancer in his face. Once the chemo is over hopes are that the face will be healed and may only require a bit of surgery. Having said that, he has been sent home for Christmas, and chemo will resume on the 30th. and we are informed that the swelling on his face has noticeably reduced. Praise God! What wonderful response we have had to our plea for finances for him. We have received approximately $1000 (£625) toward Paul's medical expenses. We need an update on the costs so far and whether there are further estimates (as we expect there will be). If you want to send him a get well card you can send it to Pastor Hesbone; he has a P.O. box in the city. Address it to Hesbone, and then in a bottom corner of the envelope write "For Paul the Pastor". It is very likely that this man has never received a card in his life! 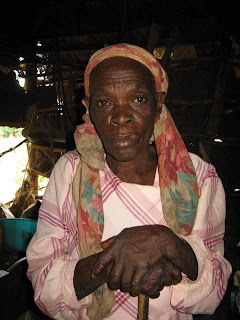 Let us explain something to you about widows in the Luo tribe and the centuries-old culture. It doesn't matter if a woman is young or old, once a her husband dies she becomes "chained to the grave" as Hesbone puts it. It is inconceivable that a widow would re-marry. It is beyond thought - we mean, it would never even enter any man's mind, to marry a widow! She is left on her own to fend for herself and her family unless she has older sons who can take care of her and their siblings. Conversely, although we are certain that some widows would love to re-marry they would never think of it as a possibility or even think of it at all. CHAINED TO THE GRAVE! Now, having said that, there are many young widows who have been widowed for several years , lets say 5, for example. Yet they might have a two-year-old child. The centuries-old practice of inheriting your dead brother's wife is still practiced amongst the Luos. However, in the old days that meant taking care of her and the whole family - all of their needs. Nowadays that no longer holds true. The oldest brother (or oldest living male relative of the husband if there is no brother) will drop by occasionally and be certain that the family name is carried on, but he doesn't take care of the woman or children. 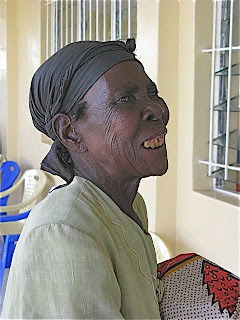 So she is not only a widow, but responsible for more lives to feed, shelter, clothe and educate. Of course, the young widow still has the normal desires of a young woman. On the other hand, it would be perfectly normal for a widower to remarry if his wife, or one of them, died. But, of course, it would be to a single woman. More news on the Widows Farm Project! The first acre has been plowed!! Yaaaay!!! The land is cleared of brush. Whereas we thought there were only two giant ant hills on the land, now that Ibraham (the man from whom we bought the land) has harvested his maize crop we are told there are two more hills where his maize had been growing. So, work is being done to remove the four of them. Marty had cataract surgery on December 22. If you can believe it - the actual surgical procedure took between 8 and 10 minutes! Seriously!! Painless, without fear. No needles in the eye - just a really awesome gel that numbs it completely; but one doesn't even feel that it is numb. She received what is known as "conscious sedation" - seems like an oxymoron - and was awake during the whole procedure. This was necessary since she was required to look through a little hole at a light, and also had to keep both eyes open. Now, although there was no sensation when she was given the sedation, and she didn't feel groggy at all, there was one point where she became so relaxed that she began to nod off and the doctor had to adjure her to focus on the light. The next morning when returning for a check up the doctor declared that Marty's vision was 20/20 vision in the eye that received the surgery. She was most pleased. It isn't usual that the vision tests 20/20 so soon, and not always possible for the doctor to achieve that result. The surgery was flawless. She told Marty that her vision would be blurred for awhile, but that eventually she would have to remove the right lens from her glasses. Thursday morning, when Marty got up her vision was totally clear in that eye and she had to remove the lens from her glasses in order to see properly. Because of the previous retina problem there was only one type of lens the doctor could use so Marty had to choose between seeing clearly at a distance or up close. She chose the former, so will need to wear reading glasses. Isn't God awesome? Isn't modern medicine awesome? An added bonus is that she can paint again. Trying to paint using one eye is impossible - no depth perception, so she kept missing what she was aiming at on the picture. Now with both eyes she hits the mark! Thank you again, so very much, for your prayers. John leaves for the UK on January 11. He will spend time with the family - celebrate Christmas with them and Lorraine's birthday (prematurely) - and take care of some medical appointments. Then he goes to Kenya on January 14 and will return to the States on February 2. It is necessary for him to go to Kadawa to oversee the Widows Farm Project and get the Operations Team organized and implemented. He is really blessed to have a companion while there. Jeremy Bell, an elder from Emmanuel Christian Centre (our church in England), will be traveling with John. We will have lots of photos of the farm to show you in the next episode. The Lord takes care of many details way, way in advance of ever knowing that such details will arise. Two years ago, when in Kisumu, Marty met a missionary couple who were looking for a place to stay and we were showing them our apartment there in Kisumu. Actually John didn't meet them until this past summer when we were there. They have subsequently become full-time missionaries there and are renting a large house. We were able to spend time with them and get more acquainted while there this year. Well - they are here in the US on sabbatical for a couple of months and have offered their home and their car to John for the duration of his stay. Isn't that totally amazing? To think that the Lord arranged our relationship - amongst other reasons - knowing well ahead of time that we would have this Farm Project and John would need a short-term place to stay. Wow, oh wow!! Please pray for his journey and pray for Marty while she is on her own. URGENT NEED FOR PAUL THE PASTOR! Hello again! Here is more information about the Widows Farm Project! But first, we want to tell you about Paul the Pastor! Whereas Hesbone is Senior pastor of the ministry in Kadawa and the surrounding area, he has under him three pastors; one of whom is Paul. He is a fine young man in his thirties; he has a wife, Eunice and two daughters, Bianca and Angela. Last week we found out that Pastor Paul has cancer of the mouth. We don't know how long he has had it, but it is extremely serious and aggressive. When we left there at the beginning of November there was no indication of it. 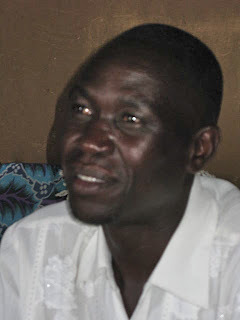 He is in great pain and has been admitted to the hospital in Kisumu. The plan is to give him chemotherapy. He must have a blood transfusion prior to being able to have the chemo. 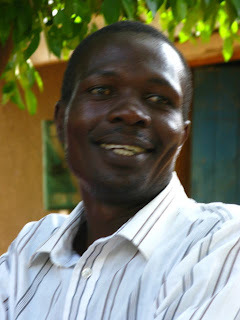 Dr. Amos, a godly doctor, who is a life-long friend of Hesbone, is the primary physician at the District Hospital and can monitor Paul closely. The costs will be APPROXIMATELY $8.50 (£5.25) per day. This is not including the cost of drugs, which, so far have cost ABOUT $92 (£56.50). These are totally prohibitive amounts for these people. We don't know where they are getting the money; however, there is no way they have money to keep paying for his treatment. At the moment, the total cost of the plan of management is approaching $900 (£552). We keep saying "approximately" and "about" because the price of the Kenya Shilling (KES), the dollar and the pound, fluctuate hour-by-hour. Additionally - these can only be estimates made by the doctors. We are letting you know the situation and if you feel or believe that you are to help, that will be a really good thing. We just want to do something to help them and believe that by letting people know about it we may be able to contribute. ABOVE ALL- please pray for this young man, his family, Hesbone and Violet and Doctor Amos. We can't begin to describe the conditions in the hospitals in Kenya. You can't imagine, in your wildest thoughts, what they are like. Unless, of course, you have been there and done that! We will see that the money gets to them quickly. If we get some pledges of money to be sent we can tap into our savings and transfer the money almost instantly. If you want to go through DOVE-Lebanon so that you will get a tax-deductible receipt, that is fine. Just let us know. Either contact us by e-mail at: johnandmartys@aol.com, or phone us at: 386-788-8633 (land line) or 386-316-1594 (mobile). UPDATE ON THE WIDOWS FARM PROJECT! Now - about the land. It has been cleared of the brush. The two great ant hills are being worked on. Now, we aren't quite sure what that means, but we do know that one of the first things to be done is to break into the ant hill and locate the queen of the colony. Once she has been removed the ants will scatter - abandoning the hill. Then the rest is relatively simple. But remember - these hills are about 8 feet tall. GREAT NEWS! We found out today that the first acre will be plowed on Friday (DEC 18) Yaaay! A second plowing will take place in January or February and planting in March. We have asked for estimates for the cost of the fence. That is next on the list along with hiring a caretaker/overseer/watchman (and building a house for him and his family). We bought the land with retirement money (doesn't everyone want to retire to a village in Kenya?) You can't take it with you and it is an investment in The Kingdom of God!! We have challenged the villagers to invest in the farm. We have told them that we have done our part with the money and they can do their part with their time. Fortunately Hesbone knows something about farming as he has been doing it on the church property for a couple of years. So he will know what kind of hybrid seed to buy for the maize and beans, and will know about the fertilizer, and when to plow and all of that stuff. John's talking about digging a well or piping water down from the church well. Oh my! A view of the land from the church! One of John's prerequisites was that the land be near the church! It is! We have purchased some land behind RCC (Restoration Community Church) - the church in Kadawa - and our vision is to turn it into a farm to produce free food for the destitute widows of Kadawa and surrounding area. the cows and goats that get on it. 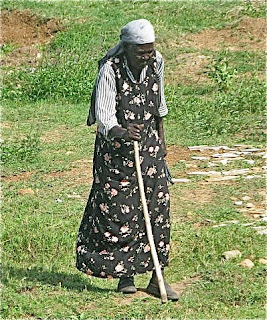 The culture for centuries has been that the oldest son takes care of his mother when she gets old and is a widow. Many of these destitute widows have lost all or most of their sons/children to aids. Then there are some who were barren - never had children. Added to that is the fact that the people are all so poor that few can think outside their own family when it comes to helping others. tree (above)! She has at least 3 ! We have challenged the people of the village to join with us in this venture. We have bought the land and we are asking them to become partners with us by giving their time - volunteering to work on the land to plant, fertilize, water, weed, and harvest the crops. All of this without expecting to be paid! It is a major learning curve. The lack of compassion for others that have absolutely no one to help them is appauling. Even Hesbone wasn't aware of the scope of their plight until we went into the homes of these very old, sometimes ill, absolutely destitute widows. We were all stunned - and Margaret's plight really brought it all home (see the blog - Margaret's House). We have cried a lot. We have committed to raise funds to develop this farm; i.e. buy seed, fertilizer, pay a caretaker/overseer, pay for plowing, put up a fence, and other expenses as we become aware of the needs for operating the farm. The goal is for it to eventually be self-sustaining. Holy Spirit began to speak to John about some more practical ways to help these women. He has wanted to buy land for a long time - very long time. He just wanted a small piece of land - not for any specific purpose other than "to walk on it". This time while we were there Hesbone realized that John was serious and began to look around the village for land for John. Then this piece of land - directly behind the church - became available. The man, a church member, had just decided to sell and it wasn't even on the market yet. No one knew about it. But when we went to look at it the whole idea of buying it to farm for the widows began to settle in to John's mind and spirit. So we pursued it. The buying and negotiation process is really an experience - totally a cultural thing. But we have done it! We have 3.5 acres, with a potential of it becoming 4.2 acres. It and the church's land are separated only by a pathway. Potentially, when it is time to plow we can have it done at the same time as the church. Our plan is to turn the land over to RCC when we get too old to go, or when we die. 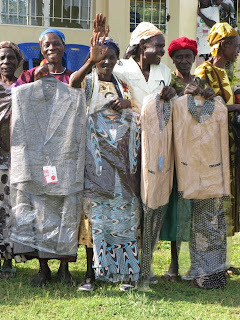 The whole idea - the reason behind it - is so that these women can have dignity in their senior years. Some of them live in just terrible conditions. We never saw any of this before. We can't begin to describe some of it. Now - having said that - at least they aren't living in the slums where sewerage runs down the streets. The land is being cleared as we write. There are two ant hills (about 8 feet tall) that have to be leveled first and then some brush. It is relatively flat and rock free. This photo shows Marty's prayer chapel. It is hollow inside those trees. Marty has asked a friend, whose husband is a farmer, if she would teach her how to be a farmer's wife! (Well - she already has learned to do a chicken.) Seriously - we won't be farming it ourselves, but will be directing/managing the operations. More about that later! Now we ask you. Isn't God hilarious? Here is Marty - 70 years old - and John 69, and we are starting to farm. What a riot!! Two city-slickers doing something like this. Isn't is exciting? What great fun! Lots and lots of challenges, and there will be pit falls, but this is totally a God thing, and He is in it and we are going along for the ride! This is John and Ibraham - the owner - looking at the map of the land we got from the Land Office. CELL GROUPS – Village and Town:Restoration Community Church (RCC) is a cell-based (home-group, life-group. care group) church. All the members meet during the week in small groups (some not so small). In the village they all meet in the daytime. Then there is one cell group in the town/city, and that meets on Thursday evenings. The cell groups in the village are all made up of very poor people, a large percentage of whom are widows. The one in Kisumutown is made up of professional people - the only one of its kind (so far). The Kisumu group periodically collects money for outreach and recently came up with a plan whereby they would visit needy people in the village. They were going to distribute some aid and also going to a house where a man was said to have "jiggers" - a flea type of insect that especially attacks the legs. They were taking medicine to treat his skin (one of the cell group members is a retired nurse) also exterminating equipment/spray to get rid of the jiggers in his house (a difficult task in a house with a dirt floor). As it turned out, the man doesn't have jiggers - he has leprosy!!! Back to the drawing board! On Sept. 18 the cell bought him a mattress (he was sleeping on a pile of rags on the floor) a blanket and some sheets – they were delivered that afternoon. There is also a plan for having his leprosy treated. More about him below. ALL CHRISTIANS ARE MINISTERS: The villagers have never been part of a church that teaches and trains its members to be ministers and servants of one another and to the world. This is one of the core values of RCC and it is being imparted slowly and steadily to the church. John has recently taught them about being servants and ministers based on Ephesians 4:11 . It has been being taught to them in different ways for at least 18 months. However he took it a step further and gave a brilliant message on practical body ministry that involves NO MONEY (something they don’t have, or is very limited) but requires their time and the use of their gifts. It was really great and struck home – we are certain. Another core value being taught is that they do not have to depend upon and expect the West and people from outside the village to meet their needs – but to be involved in meeting their own needs, and learning to depend upon the Lord to provide for them in any way and through whom He wishes. Here in RCC these values are being taught by Kenyans to Kenyans and merely being re-enforced by the wazungu (white people). This concept requires a paradigm shift! We also try to get across to them that all people from the West are not rich. This is a common misconception amongst Africans. It always brings a rather startled reaction from them when we tell them that there are poor people and street children/people in America and England. 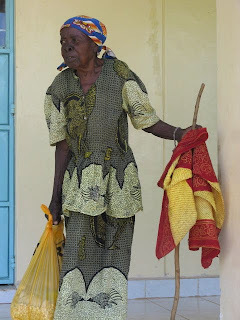 They have a hard time grasping that there are widows with very little to get by on in the West, but that some of them give us from what little they have to help the widows in Kadawa. We try to go into a little detail of how and where we get the money that is used to help them. 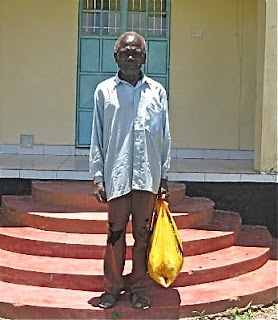 THE LEPER: Subsequent to the visit by the Kisumu cell group, the man with leprosy came to at church in Magwar (the first church plant of RCC- it meets outdoors) and told about the people who came to his house to help him and how thankful he was. It was very touching - even in the translation. We saw leprosy for the first time. The man had on sandals and had only 1/2 his toes. He had all 10 of them as far as we could tell, but only half a toe each! He is a Kenyan, but his toes were very nearly white and very thick and crusty. Staggering! We have no still photos as none of us had our cameras. Probably just as well! THE WIDOW AT ANTIOCH: We went to a relatively new cell group (named Antioch) in another village, several miles away. Pastor Hesbone had visited the house when they expressed interest in getting involved in RCC; this was only the second time he went. They have not had the advantage of the "Everyone is a Minister" teaching and basic cell-life principles. Pastor Kennedy has been assigned to that cell and another one about 4 miles away; the young pastor has a big job ahead of him. This time here was a widow there, named Margaret, who is ONE YEAR OLDER than Marty, but looks 20 years older. She is seriously in need of a new house, and Hesbone was not aware of the situation. This widow is in desperate straights and needs help big time. The two pastors did some explaining to the group about some simple basics on caring for each other, and now a plan is formulating to give hands-on training to this group in terms of assisting the widow. It is an ideal situation for training in body ministry and also on not expecting the mother church to do the job - although the people in the mother church will also become involved to an extent. We are excited about the expected outcome. A plus in this situation is that she has land with trees on it, so she will be able to supply the uprights and the saplings for the frame work for the mud. The only cash outlay will be for the tin roof, nails and a carpenter. Up until now, all the money for houses has come from us through supporters and Marty's women's fund; however, we have already designated our "housing" money, or we would build her one. See Margaret below - that's her "house". She has put on her best dress for the occasion of our visit - as the ladies do for any special event. Most likely, the next time we see her she will have on the same dress. But if we had paid a surprise visit to her she would not have been dressed that way - but more likely in tatters. The Cost for tin has sky-rocketed and the cost of a house - one where the uprights, roof frame and tin sheeting has to be bought - has nearly doubled in two years. It does vary according size and if the widow can contribute any materials. The global economy's tentacles reach everywhere! ANOTHER CELL - ANOTHER CHICKEN STORY: After we visited Antioch we went to Samaria. This cell group greeted us in the traditional style for that area. Most of them were outside awaiting us and began to sing and dance a welcome ceremony, after a bit they turned and led us in singing and dancing all the way into the house and then once inside continued the ceremony. It was awesome! They did the same when we left. This time Marty joined in with them - amidst much pleased laughter. As we arrived they brought out POPCORN (made from locally-grown maize), freshly roasted ground nuts (small locally grown redskin nuts - similar to peanuts) and biscuits (cookies). We munched on these with a drink (they actually toasted us) as we had the cell meeting. Then afterwards they served a meal of chicken (of course) beef, sukumu wiki (kale) and ugali (very stiff, boiled maize meal that is used to sop up the food and juices - yummmmm) and a very special pureed green vegetable dish that we never had before. Then there was a closing ceremony where we were given gifts. Pastor Hesbone received a bottle of ghee (a very special butter extract used as a sauce - we had poured some over our green veggie dish) and - you guessed it - they gave John & Marty a chicken!!!! Of course!!! John stepped aside for Marty to receive it (of course)! The chicken took part in the farewell dance celebration! She rode home in the boot! She also left a deposit on Hesbone's briefcase!! EXTREME EVANGELISM The Restoration Community Church (RCC) in Kadawa has a large youth group and large children’s group. Gia Minardi (the young woman who joined us for two weeks) works with the young people of her church in California, often taking them to the streets to ask God to give them opportunities to meet people that He wants to show His personal love. Gia met with the young leaders amongst the RCC youth and several others of the youth group for a day and taught them. She taught them to understand how God wants to use them individually and personally as His ministers, and that they can and do hear God. She trained them in how to go out and have confidence that they will be guided by the Lord to share God’s love. It was something these youngsters had never done – or thought of. The night of the training day, a Friday, was spent in all night prayer. Then the next day, Saturday, was market day and these kids – 8 groups of 4 per group – walked from the church to the market in the afternoon (about 2 ½ miles). The road to the market is full of people coming and going to market, and the market is packed with people. These kids asked the Lord to show them who He wanted to reveal His love to, and then would stop and tell the people how much God and Jesus loves them. As the Holy Spirit directed they would lay hands on sick people and pray for their healing, or pray prophetically for them or their families. They would tell them how God is intensely in love with them and cares for them. Gia walked with them and moved among them and she was “over the moon” at their enthusiasm, willingness and boldness. During those few hours several people accepted Christ as their Saviour. Many were touch by His personal love for them. It was amazing how open the villagers on the road and in the market were to receiving these words of God’s genuine, personal love for them from these kids. VISITING WIDOWS We have been visiting many widows – some absolutely destitute! We have visited many in previous years, but these last two weeks have taken us into some situations that were beyond what we could have thought or imagined. We also visited one widower who is old and just doesn’t really know how to care for himself. The culture is such that the women do all of the food preparation and cooking – so this man is relatively helpless. He and at one or two of the older widows we visited don’t even have a mat to sleep on. We will be purchasing three mattresses to help. 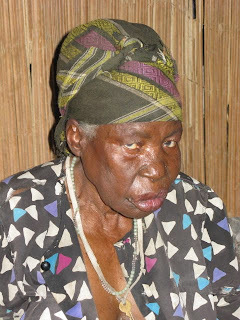 One widow – Lorna, who is 80+ years – appears to have cataracts. Few people in the village – especially the older ones – know when they were born. There is no record kept, and birthdays are not celebrated. Lorna somehow manages to get to market every week - walking! She prepares sisal, above, (a plant for making rope) by hand, and sells it there. We are talking about pennies here! CAT Scan One older widow – Florence – has recently become paralyzed on one side, and there is much swelling of her limbs on that side. It has been suggested that she have a CAT scan or an MRI in an attempt to diagnose her situation. There is no MRI equipment in Kisumu, but there is a CAT scan machine. We will use money that has been given us to get the scan done within a few days. EYE CLINICS On Sunday we went to minister at the daughter church in Magwar, some 7 kilometers away. They meet outdoors in a family compound under a makeshift awning. The children all go inside of a house for Sunday school. When we go places like that people want us to pray specifically and individually for them at the end of the meeting. One mother brought her son who can only barely see. To let light into his eyes gives him a lot of pain. Then on Monday we went back to Magwar to walk and pray on the land there where they will construct a church building (eventually). When we were finished, the man who had donated the land for the church building asked us to come pray for his grandson who has eye problems. 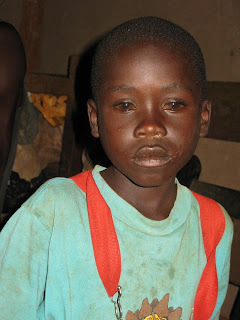 This little boy is 9 and has not been able to see properly for several years. He has never gone to school because he can't see properly. Having prayed for these little boys and for Lorna, the widow, we also want to take what natural action we can. So arrangements are being made to take the three of them into Kisumu to an eye specialist to see what he has to say and if there is anything we can do to help them. There have been many tears shed the last two weeks. It is pretty hard on us all to see this kind of sickness and poverty. RCC does not sit idly by but is continually involved in helping their people and folks in the community that are not part of the church. The need can be overwhelming! It has been really intense. HARD ON US!! How must it be for the people who are suffering?! You know, for years all of us have seen this kind of stuff in photos, on TV, etc. It is one thing to see it like that and quite another to be part of it. We will be keeping in touch again pretty soon.